No garden is complete without tomatoes. It’s the star when planting on a patio or in a huge garden. When you’re planting tomatoes, it’s important to decide how you want to support them. It will help you decide whether or not to remove the suckers. It also helps you determine the best spacing. We typically grow ours on a fence so we can maximize space, but this year in my free-spirited planting design, we are caging so we can sprinkle them throughout the garden. 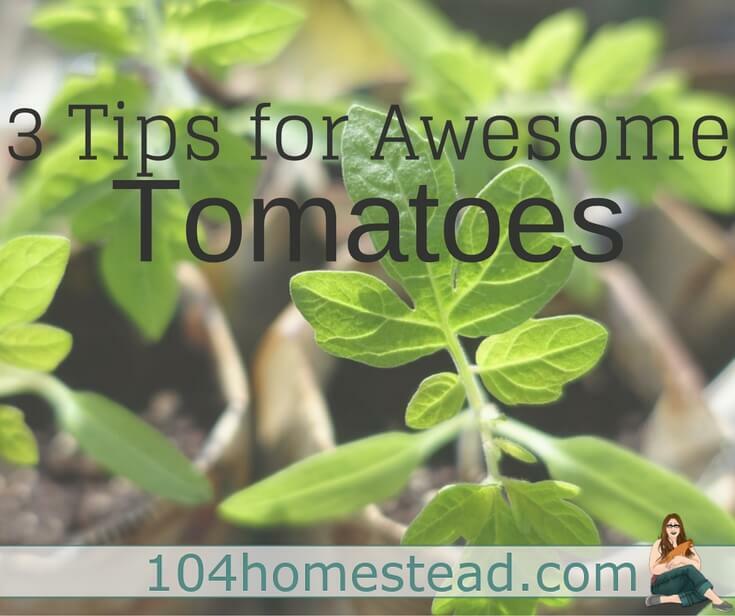 Here are my top tomato tips, but be sure to check out the ultimate list of things that go in the hole before you put in the plant from Grow Better Veggies. No, like seriously. I bend the sun rules for many of the plants we grow, but tomatoes really do need sunlight to produce healthy fruits. The only exception to this rule would be with cherry tomatoes. Those things will grow just about anywhere. You can check the sun levels in your garden by purchasing a Rapitest Light Intensity Meter (they only cost $5-10) or by measuring the sun manually. Put black plastic down before you put your seedlings in. Tomatoes prefer warm soil and if you’re up north like I am, our soil takes a while to warm up. If you are in the extreme north, you may want to keep the black plastic on for the entire season, cutting holes to plant the tomatoes in. They also have tomato-specific red plastic. According to Cornell and Clemson Universities, tomatoes grown on red mulch produce higher yields. Don’t plant your tomato seedlings upright like a normal seedling. You want strong roots on your plants and by planting sideways you are forcing the tomato plant to put out new roots. This technique is referred to as trenching and allows the plant to absorb nutrients faster. I promise it will straighten out within a week or two. When you are ready to process your tomatoes into sauces and salsas, you can save time using my pop-to-peel method. This method is the only reason why we can process our tomatoes. Here in Maine, they don’t all ripen at the same time and if we didn’t freeze them as we harvest they’d rot before we could can them. And don’t forget to save your seeds for next year’s garden. Trust me, they get better every year if you save seeds. For more gardening tips, subscribe to The Homestead Helper. You’ll not only receive garden inspiration right to your inbox, but I’ll show you other ways you can homestead where you live. What you say is true, I will apply tomorrow to get the best tomatoes. You are right, no garden is complete without tomatoes. I love gardening. Tips are really amazing. I really enjoyed your post. Thanks for sharing.